First,we express the opinion of Sunni Muslims about the martyrdom of the Prophet and his poisoning bya Jewish woman in Khyber and then we will criticize it;and then will talk about Shia opinion in this regard. Now the question is that according to Sunni beliefs, which poison was the agent of the martyrdom of the prophet. Most of the Sunni believe that the martyr of the prophet was because of poison that a Jewish woman gave him in Khaybar. The first reason: the poisoning of the Prophet (PBUH) by the Jewish woman had happened is the beginning of the year 7 AH, and his death happened in 11 AH. So it is very unlikely that his death was because of the poison that he had eaten four years ago. The effects and symptoms of the toxin usually does not remain so long, and even if remainsits effects must appear gradually and kill the poisoned person little by little, while after the Khaybar conquer until a few days before his death, the Prophet had no symptoms of poisoning and diseases and had taken part in wars and battles in full health, without any sign in his body. From these two stories and similar stories, it can be proven that the Prophet did not eat this toxic food at Khayber at all. It is certain that she did not commit a crime that the Prophet can punish her for that, so he did not eat the toxic food to get poisoned. The fourth reason: If we accept the content of the narrations that say the Prophet had eaten thepoisonous food (without knowing that it is toxic), it would cause suspicion of prophecy and denial of his claim for prophecy, because the Jewish woman, as arguing what she had done, said: “I want to know if you’re a prophet, God will make you aware of it and if you’re a liar, people will get rescued from you.” And if it is true that God had not warned His messenger of the poisoned food and prophet had eaten that food even a mouthful of that, it will lead to the refutation of the prophet according to the Jewish woman’ and other Jew’s opinion; and the It is not expectable from Almighty God that do not help his messengers in such challenging positions, which may cause people to reject them. As we see in the history of previous prophets that when people have requested a miracle from the Prophet for challenging them, God has helped His prophets to be acknowledged by people. Also, we cannot ascribe that: the Prophet (PBUH) of Allah had even eaten a bit of that poisoned food without any warning from God, and after that God have told him that the food is poisoned!, Because if so, then this event would not be considered as a miracle and knowing the unseen by the Jewish woman and other Jews; and it will not be counted as a proof of the prophecy of the Prophet (PBUH) and the cause of acknowledgment of him because they would say: after tasting a bit of food, Prophet had felt that the food is poisoned and so he stopped eating, so this is no miracle and no definitive reason of his prophecy. Even today, Jews and Christians in the satellite channels and Internet websites referring to some fake narrations in Sahih Bukhari and Sahih Muslim, which are quoted from the likes of Abu Huraira, are arguing that when the Prophet took the morsel in the mouth, the food started talking and said: “I am poisoned.”; So they undermined and questioned the prophecy of the Prophet of Islam (PBUH) and said: if he was a prophet, God should have warned himabout this. With the contradictions that exist in Sunnite narrations, we cannot accept them. But what can resolve these contradictions are the narrations from AhlulBayt (as) in this field that will clear the truth and remove the doubts about this event. So far the ayahs and hadiths show that the Holy Prophet of Islam has been killed and his martyrdom was because of a poison but not the one that he ate at Kheybar. The fact that who has or have poisoned the Prophet and killed him,is something that there are many quotations about it. Just like the narration of the story of the beheading of Imam Hussein (AS) that some say that Sanan has done it and some say that Shemr did it. 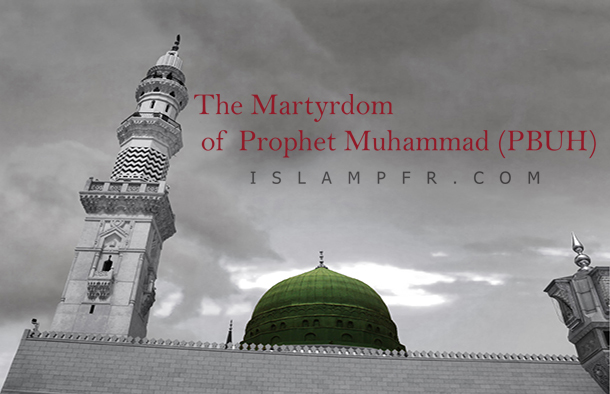 However, investigating the Qur’an, Hadiths and history lead us to the conclusion that: the holy prophet of Islam, Mohammad Mustafa (PBUH), did not die a natural death but was killed by a poison. And those who have a little study about the history and lifestyle of the prophet and Ahlul-Bayt, know that the assassination of the Prophet is not far-fetchedand by research, it can be concluded that who has or have martyred the prophet.